Usually there are lots of anglers in front of Our finca in the weekends. During the week you may go fishing without being disturbed by others. Maiz is very popular bait. Throw maiz at the buttom to attract the fish - and take them at the buttom directly from the shore. It is not possible for non-resident foreigners to get the official angling licence. Due to the increasing number of controls we can therefore no longer recommend our guests to fish here. Angling is very popular in The Lake District of Malaga - and the Gobantes area (in front of our finca) is the best place for carp and black bass. Black Bass. Gobantes (by our finca) is the best place for Black Bass. Barbel. Large barbel waters. Best in autumn and winter. Iberian Nase. Lots of nase from Autumn to Spring. 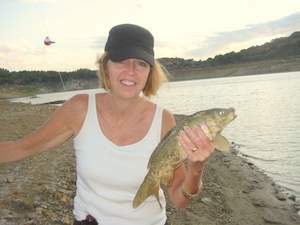 Angling holidays in Malaga Lake District, Andalusia, southern Spain. Catch pike, black bass, barbell, carp and Iberian Nase in the Guadalhorce lake, 200 metres from our fincas holiday apartments. angling carp fishing lake pike barbel black bass fishing rods dam. Catch fish on holidays while your partner is swimming in the lake in front of our finca. Black Bass caught in the Guadalhorce lake.